One-Pass Cover Crop Seeder Option for Rolling Harrow Soil Conditioner - Unverferth Mfg. Unverferth Manufacturing Co., Inc. announces the addition of a mounted cover crop seeder for its Rolling Harrow soil conditioner to provide time-saving, one-pass planting of these profit-enhancing crops. Cover crops are proven to increase available nutrients, water and organic matter and reduce soil erosion over the winter months, providing a great start for the next season’s crop. With time being very limited during the peak fall cover-crop planting season, the new cover crop seeder option provides economical one-pass planting and incorporation with the Rolling Harrow soil conditioner by itself, or combined with a lead tillage tool for enhanced residue sizing and tillage. The cover crop seeder features hydraulic-powered air delivery for covering a larger area with greater productivity. The chevron-shaped, roller-style meter provides continuous flow of most every cover crop seed for an even stand. Application rate is determined by tractor speed and an electric-over-hydraulic meter setting. Operations can be easily monitored with unit-mounted lights indicating air pressure, seed level and seed flow. Seed delivery pauses when the Rolling Harrow soil conditioner is raised, or with convenient cab-mounted foot switch. Additional features include a 40.5 cubic-foot hopper capacity, side-mounted windows for easily monitoring contents, ladder and platform for easy filling and weather-tight roll tarp with ground-level operation. It is available in producer’s choice of implement-matching red or green. The new cover crop seeder is available with new Rolling Harrow 1245 and 1245D models with flat- or stack-folding designs up to 37’, and can easily be mounted to most of these previous models in those sizes. 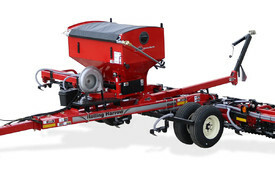 Growers can check with their nearest Unverferth dealer or visit umequip.com for complete details on the entire lineup of Rolling Harrow soil conditioners and the cover crop seeding option. Unverferth Mfg. Co., Inc. is a family owned manufacturer and marketer of tillage, seed, hay- and grain-handling equipment along with fertilizer applicators, pull-type sprayers and agricultural dual, triple and specialty wheel products. For additional information, contact Unverferth Manufacturing Co., Inc., P.O. Box 357, Kalida, OH 45853. Phone 419-532-3121 or visit the website at umequip.com.